Special edition of the Ira Kaufman Podcast today with a junior-level Sage joining the fray. He’s Rock Riley, (yes, that Rock Riley) diving into all the hot Bucs angles of the day including some you haven’t heard anywhere else, as Joe has more to share out of Bucs officials talking in Arizona last week. The fun and analysis are flowing. It’s all presented by Ed Morse Cadillac Tampa and Ed Morse Cadillac Brandon. Check out their Tournament of Savings event now while you listen! Click play above or tune in at iTunes, Google Play or Podbean.com. Stay informed, thinking and smiling every single Tuesday & Thursday — and there is NO offseason. 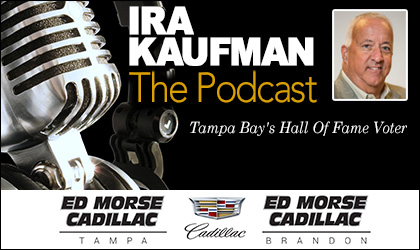 Listening to the Ira Kaufman Podcast is fun, free and easy. Enjoy! Regading the podcast on March 28th. Ira and Joe’s. I’m subscribed to this podcast on Google play. You can’t leave reviews on Google play. And after hearing your podcast on 3-28. I’m pretty sure you wouldn’t want to see the review I’d leave. Ira tied Monday morning Joe. This is my favorite podcast on the JBF network. I look forward to your podcast every time it drops. It may take me a while to get to it but I don’t miss one. And it truly pains me to hear when you have an excellent podcast going. It’s almost like clockwork now. You mention “how long is this podcast going to go on”. As a fan Ira that makes me feel like you don’t want to be there. I used to listen to you at work and several of my coworkers said the same thing. You completely ruin a great podcast and honestly it makes me want to unsubscribe. I get I’m only one guy. But you guys are all about the fans and you give me this voice by allowing comments so I’m going to use it. I said USED to listen to you at work. My job moved to Boston so we all got laid off. So here I am unemployed currently and guess what was taking my mind off of the horrible situation? Your podcast! YOUR sage wisdom! YOUR INSIGHT! YOUR beautiful banter with the Joe’s! I’m sitting here listening and enjoying the content and as usual when it goes a little long. Ira is ready to get going. Pulled me right out of a good time. Come on Ira, if you don’t want to spend a few extra minutes with us in our ears. Why should I even tune in? News flash ira. When it goes long. You guys are usually on a roll with a great podcast. I don’t take it that way. When Ira says “how long is this podcast going to go on” Its all part of the humor and the banter. Personally, I love this podcast as well. It talks about the team I love and it truly is entertaining. Nice chemistry between the personalities has grown. I hope you continue to listen to the broadcast, let it bring you the enjoyment you’ve had all along and don’t let Ira’s kidding get to you too much. Good luck to you in your present difficult situation. Be well!